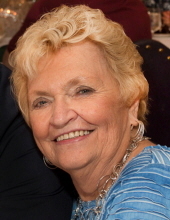 Carol J. Beucke, age 82, of Sullivan, Missouri, passed away Sunday, February 10, 2019 at Bethesda Southgate in St. Louis, surrounded by her family. Carol is survived by her children, Susan Kincaid and husband, Glenn, of Mukwonago, WI, Charles Pollard of Chrystal River, FL, and Nancy Linn and husband, Tony, of St. Louis, MO; seven grandchildren, Jason Linn and wife, Karen, of Afton, MO, Jessica Warren and husband, Fred, of St. Louis, MO, Krista Smith and husband, Chris, of Lonedell, MO, Jared Linn and wife, Julie, of St. Louis, MO, Joshua Pollard, Jonathon Poole of Oklahoma, and Jessica Poole of Oklahoma; eight great-grandchildren, Evan Linn, Lucas Linn, Logan Linn, Charley Linn, Tristin Warren, Kaiden Smith, Cira Smith, and Dawson Smith; one brother, Erwin Schaeffer and wife, Sandra, of High Ridge, MO; companion, Jim Minx of Sullivan, MO; nieces and nephews, Chris Schaeffer and wife, Lisa, Karen Prater and husband, Dan, and Synthea Fisher and husband ,Charlie; other relatives and many friends. She was preceded in death by her husband, Gale Beucke; her parents, Eugene and Flora Schaeffer; and one brother, Roy Schaeffer. Funeral services will be conducted at 10:00 AM, Wednesday, February 13, 2019 at New Testament Baptist Church in Sullivan, with Pastor Dave Wright Officiating. Interment will follow in Anaconda Cemetery in St. Clair, MO. Visitation will be held from 5:00 PM to 8:00 PM, Tuesday, February 12, 2019 at the Eaton Funeral Home in Sullivan. To send flowers or a remembrance gift to the family of Carol J. Beucke, please visit our Tribute Store. "Email Address" would like to share the life celebration of Carol J. Beucke. Click on the "link" to go to share a favorite memory or leave a condolence message for the family.